Peter Campus: Projected Video Works 1972-1980, Recent Landscapes 2007, Albion Gallery, London. March 6th-April 25th, 2008. This beautifully staged exhibition provided a unique opportunity to experience a number of the seminal early video installations of Peter Campus, one of the most significant American artists to work with the medium, alongside some examples of his recent work. Curated by David A Ross, former director of the Whitney Museum in New York, the exhibition presented four of Campus’ pioneering installations featuring “live” monochrome video cameras providing the reflective observer with an active and participatory role. The works restaged for this show- Kiva (1971), Optical Sockets, Amanesis and Stasis (all 1974) were exhibited together with six of the artist’s recent single-screen high definition video landscape works. Kiva, the earliest work on show, presents a fragmented, ever-changing and complex composite electronic image of the gallery space, the observer/participant and the video camera itself within the screen space of a video monitor. The camera, positioned on top of a video monitor, is focused onto the surfaces of two suspended and constantly moving double-sided mirrors, one of which has a hole in its centre. The oscillating movement of the two reflective surfaces produces an abstracted moving image that incorporates images of the viewer and provides him/her with a powerful sense of the multi-dimensional potential of electronic space and the crucial role of the observer in a dynamic perceptual process. Optical Sockets also presents complex multi-dimensional “real time” video. However, in this installation the imagery is the combined output from four floor-mounted cameras. The cameras define the corners of a square displaying the resulting composite imagery on four video monitors positioned within the boundary of the square. The viewer perceives him/herself in multi-perspectival overlapping versions which shift and change with each movement. Standing in the exact centre of the four cameras provides a single image composed from four simultaneous viewpoints. The two remaining early installations in the exhibition, Amanesis and Stasis, present manipulations of “live” camera images displayed via video projection. 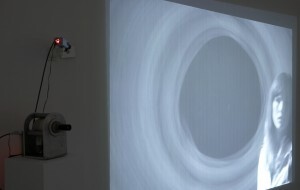 Both of these works display an overlapping mix of two images of the viewer; in Stasis a rotating camera shifts one of the images in a clockwise direction, bending the figure away from the static image of a second camera; in Amanesis, a brief time-delay presents the viewer with images of his/her own immediate past. Aside from closed-circuit installations Peter Campus also exhibited a number of influential videotapes during the 1970’s. Between 1971 and 1976 he developed a series of important single-screen works produced in the main at WGBH TV in Boston, the most well known of which is the seminal work Three Transitions (1973). This videotape presents three short episodes each of which show sequences of the artist initially contemplating his own image. These images then proceed to eradicate themselves by the agency of video imaging mixing techniques and chroma-key. During the later part of the 1970’s and the 1980’s Campus abandoned video altogether and embraced black and white photography, eschewing the human figure in favour of images of natural and man-made landscapes, only returning to the electronic moving image again in the mid 1990’s. The six recent works on display at the Albion such as the earth is nowhere (2007) (the title derived from a line in a poem by Rainer Maria Rilke) blend Campus’ preoccupations with the landscape with a fascination for the capturing and framing of the temporal image. The other works in this series: predominance of our constructs, bridge of clouds, land of counterpane, lines of longing, so real a presence (all 2007), reflect a concern for the impact of human indifference to the natural environment. These elegant new works of sound and picture, recorded in high definition video in the area around Ponquogue Bay on the Eastern shore of Long Island, juxtapose subtle natural rhythms against carefully composed details of man-made constructions; motorway bridges, floating buoys, concrete structures. Despite the thirty-year gap between these two groups of works, there was an unanticipated harmony to the exhibition. The curator has achieved a careful balance between the historical sculptural installations and the back-lit LCD screens of the new environmental digital video pieces. The two sets of works did not clash, nor did the ambient sound of the new works jar with the contemplative silence of the earlier more sculptural works. Throughout the exhibition Peter Campus’ intelligence and consummate formal judgment was sympathetically facilitated to engage and encourage the viewer to reflect on the powerful potential of the electronic moving image to open up new perceptual spaces. i Peter Campus, “Video as a Function of Reality”, from the exhibition catalogue, Everson Museum of Art, Syracuse, New York, 1974.